At the end of March 2018, we will be releasing the first wave of many updates coming to our platform that will modernize the design and functionality of our software. Our goal is to keep you informed ahead of time as much as possible, so you can expect updates regarding this release as they become available. For now, we've broken down the bulk of what will be improved below. With this release, Company Administrators and employees will have the option to upload a photo to an Employee Header. The Employee Header is a banner that will be located at the top of your screen that will show the basic employee information, including their photo. The Employee Header will walk with you throughout the software so you will have all the employee information available at a glance. Administrators will have the ability to toggle the option for Employees to upload their own photo to best fit your company needs. You can change which employee you’re viewing easily from any screen, and can even add filters to simplify the search process. The majority of the changes will be made under the Employee Menu and have been detailed below. Want to see a before and after version of the pages that have changed? Click here! The Add Employee option will be removed from the sidebar menu. In its place, a “+ Employee” button will be added to the Employee List page. You’ll notice that when you go to add an employee, there will be no Employee Header. This is because there is no information to show before you’ve filled out the information. The header is still visible when you go to edit an employee, however. On the Pay and Tax screens, there will be left-to-right alignment so your cards are side by side for easier use. There is a different view depending on whether the employee listed is hourly or salary, as depicted below. On either screen, you can add notes to the different rates, indicated by the "+" symbol, or change the rates at the top of the card. Here is the view of your Hourly employee screen. Here is the view of your Salary employee screen. With a similar look to the Pay screen, you will have the side-by-side cards that allow you to see everything from one screen. Other than the layout, most information contained is about the same with just a few minor improvements. There have been further updates to the various pages under the Employee Menu. Most of these will follow a similar layout as the screens shown above. Keep in mind that the minimum number of fields necessary will be displayed, with more populating as needed. Options such as Time Off Policies and Custom Fields, for example, will only appear as you add them to the system. This will further simplify your processes and improve the functionality of the software all around. There are some major changes coming to the Applicant Tracking System. 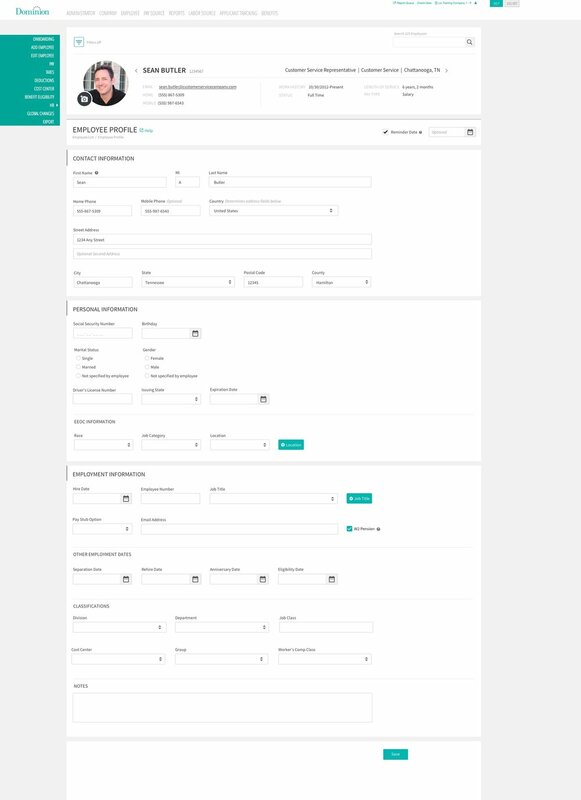 Most of the screens within this platform will be getting a similar look to what’s being updated in the Employee Menu, with the exception of the Hiring Workflow and the main Dashboard. The actual hiring workflow won’t be changed (yet! ), but there will be separate cards for each job category and the job openings are listed out as squares on each job card. If a category has no openings available, the card will not show so there is no need for a “no openings at this time” message to be displayed. Check out before and after screenshots here! Here is an example of a job post with our new layout. A Job Board will be added to the menu so administrators can see what it looks like once they post the job. There are different colored flags that are visible to applicants that indicate whether they have already applied for a position (flagged in green), partially finished an application (flagged in blue), or not started an application (flagged in teal). If they have already applied for a job or are in progress, the “submit” button will adjust accordingly. The Job Board will display all current openings in an easy to navigate screen. For clients who are currently using our Applicant Tracking System, please note that we will send you a more specific breakdown of what will be changing so you are prepared ahead of time. If you are not using Applicant Tracking and would like to, please email info@dominionsystems.com or request a demo below. Older PostShopping Payroll? Consider These Factors.